Growing up in Mombasa, Kenya as a young boy I was occasionally teased by North Indian kids with the expression “Goa machi kathore” – these were kids usually with origins from Punjab and Gujarat. The term was meant to be derogatory and was a reference to the fact that Goans liked to eat a lot of fish! Now why Goans would be singled out and be subject to disparaging comments because of their affinity for eating fish is a mystery to me today especially since the Bengalis are also avid fish eaters! But at the time, one did not go into such subtleties – one merely responded with some sort of disparaging remark about the culinary habits of those who made fun of me! Pretty harmless teasing, all things considered. Never mind, that I was not Goan – to those from other parts of India such finer points were neither here nor there. The only sizable group of Indian Christians in Kenya – in fact, in East Africa – were the Goans. Being a Christian from Kerala, my family was grouped with the Goans since Keralites were an insignificant minority in Kenya. Sure, there were a few things that puzzled people – for example, my mother wore a sari and most Goan women wore dresses – or “frocks” which was the usual nomenclature used! But one thing they were right about despite getting our origin wrong was that Keralites also eat a lot of fish! So one could rightly have said: “Malayalee machi kathore” – and they would have been on the mark! All of this came to mind when we visited Goa during the past week during our annual sojourn in Kerala. We spent a thoroughly enjoyable five days in Goa – a place I last visited over forty years ago when I was doing an all-India tour in my Standard Herald car. I spent a couple of days in Goa on that occasion. We stayed in Panjim – which is the capital of Goa – at a hotel that was arranged for us. The Palacio de Goa – was centrally located and very comfortable. About my only complaint was that I could not get coffee until well after 7am which given my weird waking hours meant an impatient wait for a couple of hours! A relatively minor draw-back all things considered. Goa is a remarkable, very picturesque place – and I can well understand why it appeals so much to Western (mainly European) tourists who were there in abundance – which was all the more remarkable given that the peak season is in December and January when the hotels are apparently packed! We were told that in season, the beaches are teeming with Western tourists so much so that a visitor would think one was in Europe! Goa’s appeal is because of beaches that are out of this world – there are 33 beaches in Goa! The beaches and the city as a whole are clean, the roads are excellent and most busy roads have side-walks so you don’t have people walking on the road. The Goan people, who look rather like the Sinhalese in Sri-Lanka, are very friendly and although Konkani is the main language, English is spoken by just about every one. Booze is plentiful and cheap, there is an abundance of sea-food also reasonably priced especially when compared to prices in the West or even within India and amenities are geared to suit tourists. For example, when we arrived at the train-station in Margaon, there were a few young Westerners who proceeded straight to an adjoining section where there were dozens of motor-cycles and scooters parked and available for rent. Within no time they removed their shirts and set off on motor cycles riding bare-chested! There are lots of activities available at the beaches, especially things like para-sailing and jet-skiing – all priced at a fraction of what it costs elsewhere. Our guide told us that tourists can still get drugs here though not as readily as it used to be available when Goa was a hippie haven in the sixties. Today, as he put it: “one has to find it”! There are several floating casinos which we did not visit though if time had permitted, I’d have liked to do so. Interestingly entrance to the casino costs R2,000 per person which gives one unlimited food and booze. I guess they encourage people to drink a lot since it makes them more likely to gamble freely – rather like what happens in Vegas. In terms of topography, there are lots of coconut trees, cashew trees and other types of vegetation – not as green as Kerala but nonetheless very pretty. Lots of movies get shot in Goa – while we were there a Telugu movie was being shot! As we were taken around it reminded us a lot of some of the Caribbean islands which we have visited during cruises. 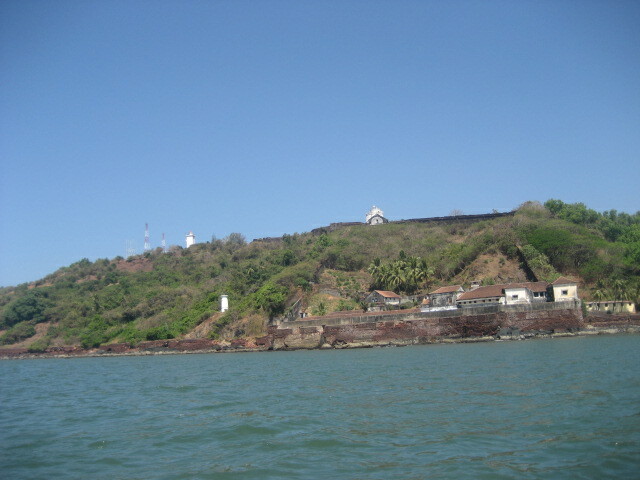 Some of the older buildings show Portuguese influence from the days when they ruled Goa. The weather was great – not too hot and the humidity was mild compared to Kerala. The guide we had the first day was pretty good and though he spoke in Hindi – with a little English thrown in – to a tour group that consisted entirely of Indians from other states, I was able to follow most of what he said. Apparently, the typical cuisine of Goans is fish and rice with fish served at both lunch and dinner “Goa machi kathore” indeed! Vegetables and fruits don’t seem as abundant as they are in Kerala and don’t appear to be an important part of the diet in Goa. 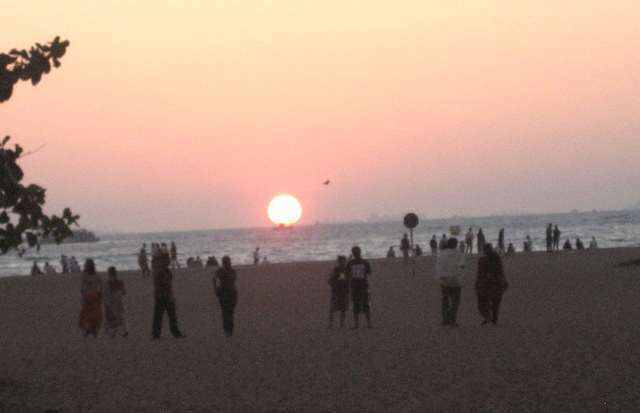 The population of Goa is 1.8 million people but during the course of each year there are over 10 million who visit Goa mainly from other parts of India. The demand for sea-food is so great that although Goa is able to catch sufficient sea-food from their coastal waters for the needs of the local population, they have to import tons of sea-food from Karnataka and Maharashtra to meet the needs of tourists. We enjoyed the Goan cuisine that was served and did indulge in a fair amount of sea food – king-fish, rock fish and prawns including tiger prawns – the latter were a good nine inches in length (and considered to be medium sized!). The owner of the hotel where we stayed recommended a restaurant called “Ritz Classic” for authentic Goan food – he said that it was one of the most popular places in Panjim where locals would take their families. The decor was nothing to rave about but the place was clearly a popular haunt and crowded. Most people seemed to be ordering varieties of sea food – lobsters, tiger prawns and fish. Both the starters as well as the entree was seafood – and people ate lots of seafood with rice being more in the way of a garnishing! We went for dinner one evening to a place called “Mum’s Kitchen” near Miramar Beach – ostensibly serving authentic Goan food. We were one of the first customers though the place filled up later mainly with Westerners. It was a somewhat upscale restaurant with none of the banter one experienced with waiters at other restaurants – and definitely over-priced by Indian standards. The food was average though the decor and ambiance made up for it. It was clearly a place geared mainly for Western tourists. I would not go there again. One place that I would most certainly recommend was located right next to “Mum’s Kitchen” where we had lunch. It is a family owned and run restaurant called “Espynick” – excellent food in an unpretentious setting with friendly service and very reasonably priced! This is where we had a Goan fish preparation using rock fish – the name of which escapes me. I would certainly recommend the dish as well as Espynick. On the two conducted tours we took – each lasting an entire day – the other tour participants were mostly a much younger group. We quickly became “Uncle” and “Aunty” to them – somewhat similar to what happened when we visited Munnar. We were treated with the utmost courtesy and respect – a deference to the fact that we were older and also because we were from the US which garners a certain amount of attention. Emigrating to the US is still an aspiration of many young Indians – evident when a few of the younger guys wanted to know the process for getting approved as immigrants. The other thing we have noticed is that there is a certain amount of respect mixed with curiosity accorded to us because we are quite active compared to older people in India who view retirement as a time when one should behave accordingly and not indulge in the type of activities one associates with younger people. One of the younger guys was all excited at the possibility of my going on a jet-ski with him with exhortations like “Let’s go Uncle!” – I did not do so only because I did not have a swimming trunks. He was wearing a pant and shirt but was oblivious about getting his clothes wet. Some things one associates with India – like the indifference to punctuality – is in vogue when it comes to Goa as well. At various stops the guide would specify when we were expected to return to the coach with warnings that after a five minute grace period, the bus would proceed onwards leaving tardy passengers behind. Well, that was just idle talk – we were habitually late leaving and it did not help matters when the guide himself would return late!! The deference to age mentioned earlier is quite striking. On our return from Goa, we had two sleeper births located on the side of the train next to aisle. Mini was asking the TT (ticket inspector) as to whether we could be moved to berths in a compartment. The TT said there were no lower berths available elsewhere. A young couple in the adjacent compartment overheard the conversation and the guy offered to give up his lower berth to Mini and said that he and I could sleep on the upper berths – an entirely voluntary gesture without being asked by us or the TT. A nanny (Jessy) working for my daughter Saira in the US whose son-in-law and daughter are currently stationed in Goa also displayed the same deference to us. They would check on us every day to make sure that all was well. When I thanked Jose (the son-in-law) profusely for all of his help, his response was that he only did for us what he would have done for his own parents! This from a couple whose sole link to us is our connection to Jessy! Jose picked us up from the station on our arrival and saw us off – making sure that we were safely ensconced in our coach before he left for home. Senior citizens in India – defined as anyone over the age of 60 years – can get concessional train fares: 50% off for women and 30% off for men! Imagine the reaction in the West if there were this sort of gender discrimination!! We are always told that we need to carry proof of age when one avails of these concessional fares – but neither of us have been asked to produce any until our train journey to Goa when the TT wanted to see proof of my age! I was flattered and provided ID to him happily and asked him whether he had any doubt that I was over 60 years. He said that I looked like I was 50 and shared with me that he was 49 – whereupon he became my favorite TT in the Indian Railway system!! Alas, the TT on our train journey to Cochin did not want to see my ID – I guess I must have aged while in Goa!! We visited a couple of churches and temples. One of the churches houses the body of St Francis Xavier – the body which (in pictures) looks somewhat “mummified” rests in a coffin at an elevated level and cannot be seen except every ten years – it will next be visible to the general public in 2014. The body is 450 years old! Apparently it used to be available for viewing all the time a few decades ago but some worshiper who got carried away while viewing the body bit off one of the toes after which viewing was limited to once every decade for a couple of weeks (with strict security all around). The conducted tour took us to a house that was at least 200 years old and used to be occupied by a Portuguese/Goan family. Lots and lots of period furniture, paintings and other artifacts from that time which were interesting to view. What struck me most was the remarkable lack of security in terms of guarding these old heirlooms. There was also a reminder from our tour of Ephesus in Turkey, in the set up at the toilet. Apparently, the use of the toilet – like in Ephesus – was a communal activity in that there were several built-in commodes next to each other and we were told that people would use them in communally. They would be seated next to each other and conduct conversations while doing their “business”! Also, interesting was that in this Christian household, there was a key employee who was Hindu and his quarters which were part of the main household had various Hindu religious artifacts and images including 1881 little statues of Ganesh – each one different from the other! I bought a couple of bottles of coconut fenny (or fenni) to bring to the US to give to those who imbibe – fenny (coconut or cashew) is THE local alcoholic drink in Goa. I have had fenny in the past when I lived in Bombay, though I don’t recall the taste. I was told that it tastes like rum! Incidentally, the guide claimed that fenny is the reason why Goans are healthy and that there are so few hospitals and medical stores – he said that between coconut fenny and cashew fenny, they take care of a variety of ailments ostensibly because of their therapeutic effect ! Not sure if there is any scientific basis for this claim but I will say that compared to people in Kerala, the Goans seemed a lot more fit and less over-weight. Perhaps it is the emphasis on sea-food within the diet that helps keep them healthy. I’ll just say in conclusion that we’d visit Goa again in a heart beat – though we’d probably stay in a hotel close to the beach. I’d encourage everyone if the opportunity presents itself to spend a few days in Goa – you will most assuredly enjoy your stay. I really liked this posting about Goa. Having spent a week in Goa, I can relate to much of what you have written. My first visit to Goa was in 1968.I was a student at Wilson College in Mumbai(Bombay then) and during the Christmas break a few friends decided to head to Goa.After an interesting bus journey we arrived in Goa and instantly fell in love with the easy pace of life and the serenity of the place.Needless to say mainstream India and the Western world had not yet “discovered” this jewel. I have not been there since but from what friends and colleagues tell me it has become a fast paced tourist spot with millions visiting every year. Muru, things have changed a great deal since those days. There are an amazing number of tourists from other parts of India – mostly the younger generation in the twenties and thirties. We plan on spending at least a week next year when we do our annual sojourn to India to escape the winter here in Northern Virginia. 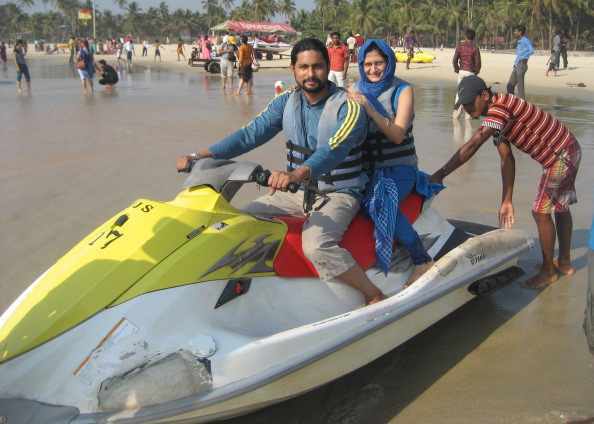 Goa really is a wonderful place to vacation.